Philip Henry Sheridan was born in the Roman Catholic community of Somerset, Ohio, on March 6, 1831. Sheridan quit school at the age of 14. For the next 3 years he worked as a clerk in a county store until he was admitted to West Point Academy. He barely made it into West Point and while he was there he got into a lot of trouble. Philip threatened another underclassman with a bayonet and then beat him up. His punishment required that he spend an extra year at West Point. Sheridan finished 34 out of 52, in the class that graduated in 1853. Immediately afterward he reported to Texas as a second lieutenant in the infantry. Just 3 years later he was transferred to the Oregon Territory where engaged in several conflicts with hostile Native Americans. He would be elevated to first lieutenant as the Civil War approached because many officers had deflected to the Confederate Army. When the war broke out Sheridan was living in St. Louis, Missouri, working in administration. At the time he was issuing vouchers for supplies that he had procured from Confederate sympathizers. Sheridan soon found himself threatened with court martial, but instead of court martial he was elevated to captain. During the next year he became close friends with William Tecumseh Sherman and General Gordon Granger. When Granger received a promotion he put Sheridan in charge of the 2nd Michigan Cavalry. From that point he rose to the top rapidly. Not long afterward, Sheridan defeated a Confederate force 6 time larger than his in Booneville, Kentucky. He did it with a new repeating rifle. As a reward, he was given a division to command and elevated to brigadier general. Sheridan was only 31 years of age. He would next win battles in Perryville, Kentucky, and Murfreesboro, Tennessee. By this time Ulysses S. Grant was impressed with Sheridan's performance in battle. When Grant assumed command of the entire Union Army he had Sheridan take command of the 12,000 man cavalry corps of the Army of the Potomac. Just 1 month later he killed Confederate General J.E.B. Stuart, and destroyed his cavalry unit. He would next defeat the Confederate Army commanded by General Jubal A. Early. Instead of chasing down Early, Sheridan began pursuing a “scorched earth policy.” Systematically he began destroying the agricultural region that produced the food that the Confederates badly needed. Sheridan and his men burned over 2,000 barns filled with food, 70 flour and wheat mills, and killed thousands of farm animals. He believed that the war could not be won on the battlefield alone, that a victory could only be insured by destroying the food supplies, as well as the morale of the supporters. Sheridan wanted to make sure that the South had had enough war. In February of 1865, Sheridan's forces joined Grant in the Petersburg Campaign. Soon afterward his forces stopped Major General George Pickett at Five Forks in a battle that would forever be known as “Pickett's Charge.” The loss forced Lee and the Army of Northern Virginia to retreat. At the same time the win cut off rail supplies to General Lee. Sheridan is also credited with stopping Lee at the Appomattox Courthouse, which forced Lee's surrender. After the war, Philip Henry Sheridan fought Plains Indians, led an expedition to deter Maximilian from invading Texas, and he led restoration efforts in Texas and Louisiana. Sheridan was also called on to command troops during the Great Chicago Fire. 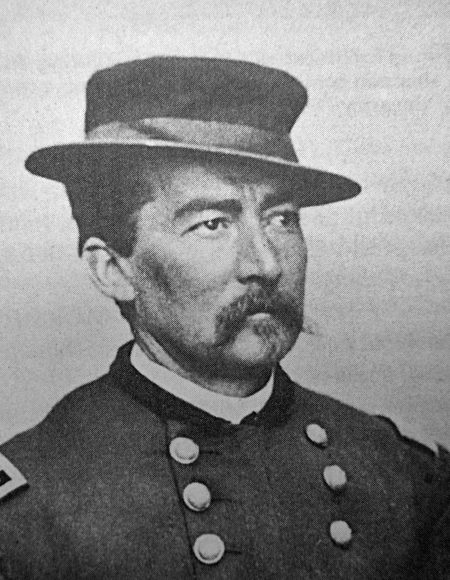 Today, historians tell us that General Philp Henry Sheridan was the Union's best cavalry commander.